Something that often gets overlooked is the spring on the pump arm. Some springs get weak over time and some aftermarket arms come with weak springs. If the spring compresses during quick throttle opening you are losing RATE of opening, so going to a more aggressive cam will just compress the spring more and result in more shot later where you probably don't need it. If this is the case the spring either needs to have shims added to make it shorter/stiffer or replace it with a new Holley or equivalent spring. You can check this visually by opening quickly the throttle by hand while watching the pump arm. You can tell if the spring compresses. 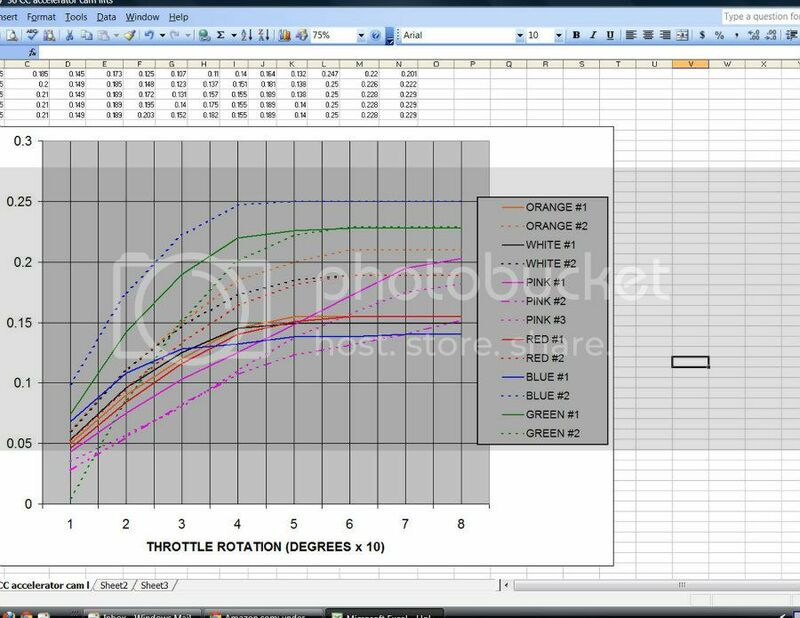 There are some pump cam charts and graphs available showing lift vs rotation and I've always gone by the Holley graph. I've always questioned it though because it didn't seem to jive with the visual profile of some of the cams - especially the green and white. A few weeks ago I finally took the time to set up a dial indicator and degree wheel on a 4150 base and record the actual PUMP ARM lift vs throttle rotation for positions 1 and 2 of each cam (the pink actually has 3). Sure enough there are some discrepancies with the Holley graph. I have this info in an Excel chart and graph and would be glad to share it but I'm not sure how or if you can attach files here. Just Primer, if you want to pm me your e-mail I'll send it to you. Open that document then do a "print screen". After that, open that with MS Paint and save it as a .jpg picture file. Then you can upload it to your Photobucket or other hosting service but you'll likely have to resize that photo to 800x800 max to have it show up here in a post. Finally got around to resizing the image. Hope it helps. Looks good! I'm proud of ya!